We kick off our end-of-year support campaign on 28 November #GivingTuesday! On #GivingTuesday we hope to raise $500 to kickstart us on our way to our annual end-of-year fundraising goal of $7,000! Here’s how you can participate to get involved with us! Follow – Like our page on Facebook and follow along with our updates! Having support from near and far and being able to share progress with you helps keep everyone motivated as we work through a long season. Volunteer – Sign up to volunteer during the 2018 turtle nesting season. 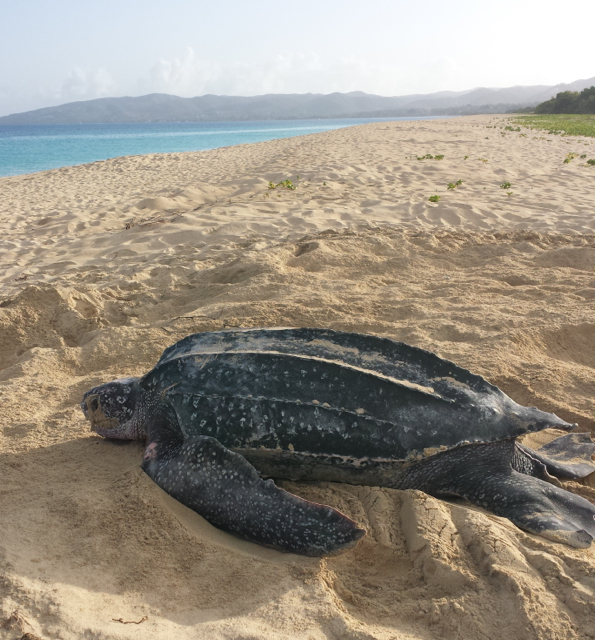 We are looking for all St. Croix (Virgin Islands) residents who are interested in spending some time in nature, and protecting the beautiful sea turtles that nest on the island. We’ll hold an information meeting in March for everyone. To be included at that meeting, email us at: SandyPoint.Leatherbacks@gmail.com. Donate to support our fundraising goals. This year our campaign aims to raise $7,000 before the end of December. All funds will go to support the following key goals for next year! Our sweet home at Cottages by the Sea! A special Turtle Camp! Turtle Camp $1,500 – Our home base at Cottages by the Sea sustained some damage during Hurricane Maria’s rampage through the west end of St. Croix. We’d like to make some improvements to our living quarters, replace some appliances, and make sure the camp is comfy for the arrival of our volunteers. We are hoping to raise $1,500 toward this goal. Our team of volunteers taking notes on turtle nests at sunset. Volunteer support $2,100 – Each year we host up to six primary volunteers and several field helpers. Many of our volunteers are students who are participating in their first field experience, or they are studying an aspect of the turtle’s life that will help them earn senior projects or masters projects, while contributing to management and conservation. Because these experiences are volunteer, we want to support everyone as much as possible, by buying groceries and uniforms, helping them with travel costs (if they are from off island) or by covering their accommodation. This season, we aim to raise $2,100 for our volunteers. Every little bit helps! New, better equipment $3,400 – All our nesting turtles are first identified with flipper tags and also with microchips (PIT tags). Flipper tags allow for easy identification in the field but the PIT tags last much longer as they are under the skin of the turtle. A special reader is needed to detect these tags. We would like to buy four new PIT tag readers that will detect any type of microchip; different projects throughout the Caribbean use tags with different frequencies. These universal PIT tag readers have just come on the market, read all types of tags and are waterproof! They are just what we need! Each reader is $850. We would like to raise $3,400 to buy these for the 2018 season. We hope that you will help us reach our goals for the 2018 season. And we want to thank you for your ongoing support! All donations above $25 will receive a comfy project t-shirt from us. See your t-shirt options here! Support us here! All donations are fully tax-deductible as The Ocean Foundation is a 501(c)(3) organization. A leatherback nest at Sandy Point with Frederiksted in the background.